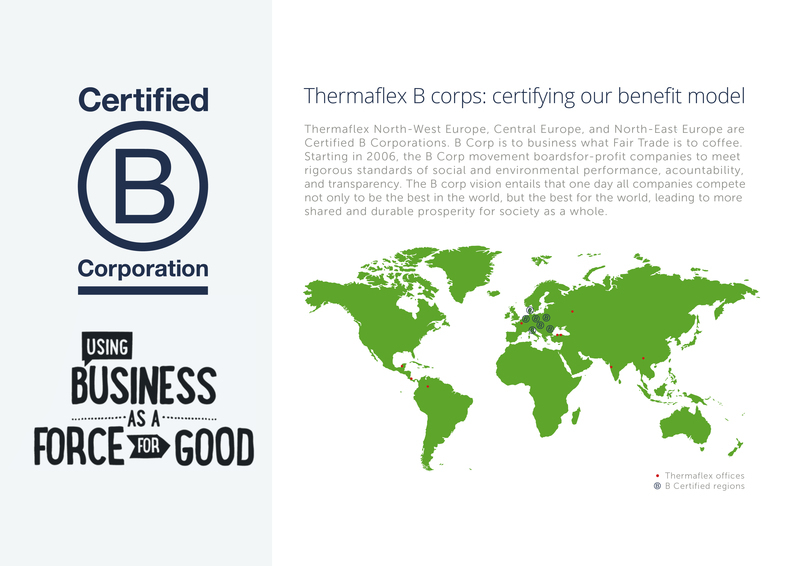 Today marks an important milestone in our efforts to license our business as a force for good, as Thermaflex Central Europe (Germany, Austria, Italy and Romania) is officially recognized as a B corporation for the positive social and environmental change it consistently effectuates. In the market, numerous developments underline this positive impact such as our continuous improvements in the energy performance of our solutions, our focus on healthy and recyclable materials through the Cradle to Cradle commitment, and our Code of Cooperation based upon compliance with Thermaflex policies & international standards on human rights, labor, environment and anti-corruption. In our own organization, we run various in-house programs to minimize our environmental impact. 100% of our energy use comes from renewable sources. Next to that, quality assurance and environmental management processes are well implemented and our impacts continuously monitored. We also recently launched a reclaim program to take back all residual insulation wastes and recycle them into our production process. Check out the global impact we made in 2015 in this infographic! In our ambition to become a global B corp, Thermaflex Central Europe is the third B-certified member of the Thermaflex group, next to Thermaflex North-West Europe (NWE) and Thermaflex North-East Europe (NEE). We highly value the B corp framework and community, which provides both guidance, focus and partnership in our dream of a sustainable future for generations to come.